As a child, I loved to decorate Easter eggs. It was always a rite of spring. I recall my brother and I sitting at the kitchen table with the Paas eggs dye set up in front of us and eagerly waiting for mom to bring over the hard-boiled eggs for us to decorate. We would fight over the colors, with each of us wanting to dip our eggs into the same color at, of course, the same time. Siblings behaving badly….. oh well. Today, there are a myriad of new ways to decorate eggs for Easter. Some methods seem crazy expensive considering eggs are perishable. 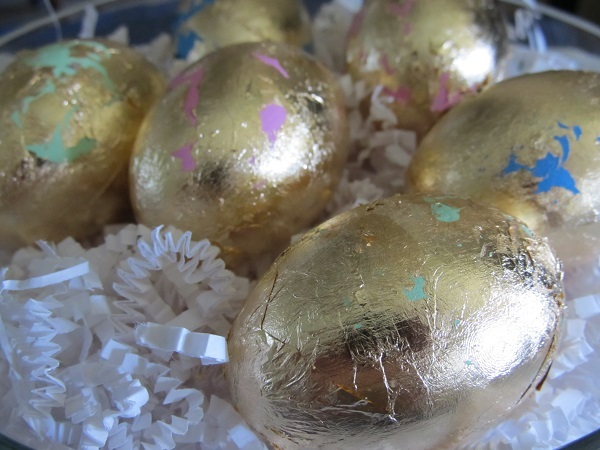 Recently, I discovered gold gilded eggs but the project used hard boil eggs or empty eggshells. Gold leaf is not a cheap supply. A package of 25 sheets is roughly $8.00. It seemed to me there had to be a way to get the same gilded egg look and still be able to use the eggs the following year. Michael’s, Hobby Lobby and Joanne’s carry other egg shaped materials that let you decorate eggs for Easter and keep them from year to year. I popped into Hobby Lobby and picked up six plaster of paris eggs, some fun paint colors and a package of gold leaf. I started by painting each of the eggs a bright color and then let them dry. After they the dried, I applied the gold leaf to the eggs and then rubbed off some of it to let some of the color peak through. The results weren’t too bad for the first time using gold leaf. I will tell you though, I got it all over me. Editors Note: Four years later and the eggs are still being used.